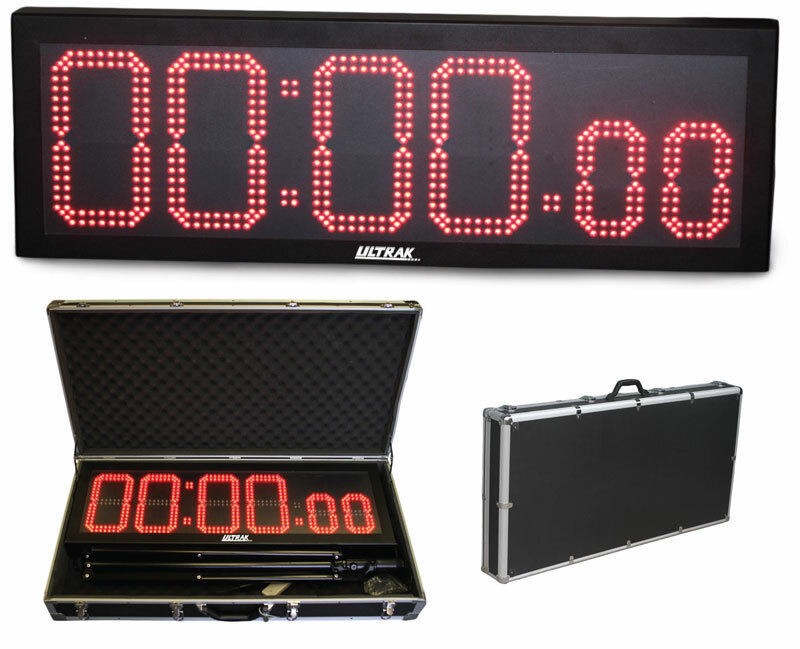 The ideal display timer for any situation, the T-150 is easily viewable for both indoor and outdoor events with excellent brightness. The Ultrak T-150 can time up or down from 99 hours, 59 minutes, 59 seconds and users can control resolution of one second or 1/100 second. The first four LED digits are 8 1/4-inches tall while the last two digits are 5 1/2-inches tall. The timer is operated by buttons on the side of the unit and its wireless remote control. It is powered by an AC adapter or internal rechargeable battery. The rechargeable battery lasts up to five hours of continuous use from its full charge. The Ultrak T-150 is 35 1/2-inches wide by 11 3/4-inches high. The unit can be free-standing on the ground or a table or it can be mounted on its sturdy tripod. Each T-150 comes standard with tripod, nylon carrying bag, hard-side carrying case and wireless remote control. • Count up or count down time with range to 99 hrs. 59 min. 59 sec.